So you’re throwing a 4th of July BBQ and you want some small munchies for guests to nibble on instead of the typical celery and carrot sticks with onion dip. These pecans are your answer! They’re supremely easy to quickly toss together, so they won’t add any extra stress to your party day planning. I was annoyed that I had to go out and buy a whole bottle of dark rum just for the recipe’s 1 tablespoon, but I’m glad for it now because I make this recipe quite frequently and I warn you, you’ll experience the same: once you put these out, they won’t last long, so make a double batch. Heat oven to 350 degrees. Line rimmed cookie sheet with parchment paper and spread pecans in even layer. Toast 3 minutes, shake pan to redistribute nuts, and continue to toast until fragrant and color deepens slightly, about 3 minutes longer. I personally prefer slightly less toasted pecans, but you can toast them to your heart’s desire, of course. Transfer cookie sheet with nuts to wire rack. For the spice mix: While nuts are toasting, stir together sugar, salt, cinnamon, cloves, nutmeg and rosemary in medium bowl; set aside. For the glaze: Bring rum, vanilla, brown sugar, and butter to boil in medium saucepan over medium-high heat, whisking constantly–I am serious about the MEDIUM sized saucepan: the first few times I made this recipe I always decided, “well, it’s just a small amount of ingredients, I’ll use a small saucepan” and then I get to the next step and have to transfer the mixture to a bigger pot, cursing myself for forgetting AGAIN to follow instructions as written. Pour in the toasted pecans, stirring constantly with wooden spoon until nuts are shiny, which takes just a couple minutes; there should be no syrup left anywhere in the pan but on the nuts. Transfer glazed pecans to bowl with spice mix; toss well to coat. 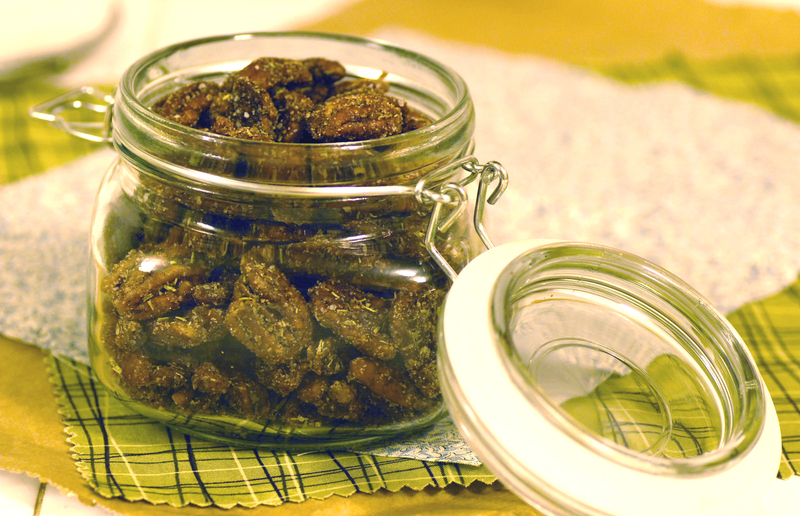 Return glazed and spiced pecans to parchment-lined cookie sheet to cool (can be stored in an airtight container for up to 5 days). I know you guys were salivating over the placeholder picture of these cookies I had up for 6 months before actually getting a chance to start my blog…and here’s the recipe finally! I’ve had a super busy week and I’m preparing to head over to New Hampshire for my cousin’s graduation on Friday, so I’ve been running around like crazy trying to get ready. So with that said, please forgive me for just the one brief post this week, and a not very personalized one at that. In the recipe’s defense, Cook’s put together a recipe so flawless that it doesn’t need any adjustments from me anyway and you should not hesitate to whip up a batch as soon as you can. The long ingredient list is daunting, but not so scary once you realize that most of it is just spices that make the cookies delicious. I brought a batch of these into the spa I go to and they were gone before my nails were dry! 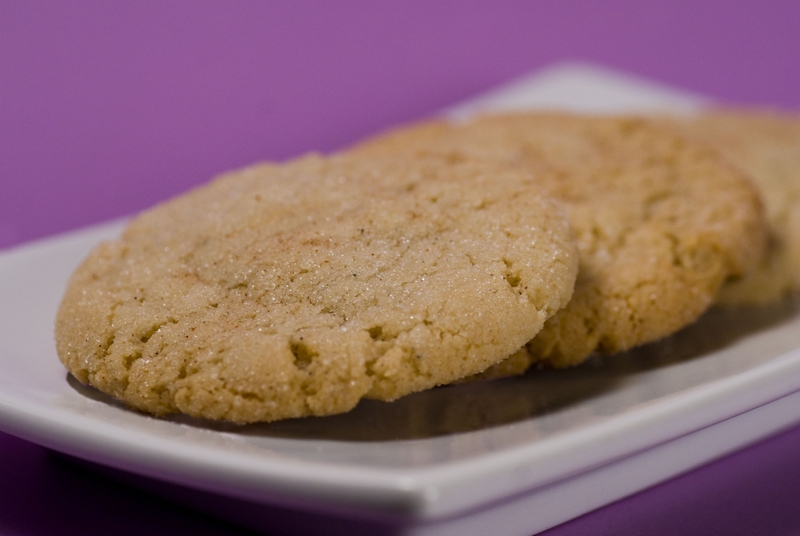 A sophisticated twist on the well-known sugar cookie. Place 1 ½ cups sugar, cream cheese, cinnamon, ginger, cardamom, cloves, and black pepper in large bowl. Place remaining 1/3 cup sugar in shallow baking dish or pie plate and set aside. Pour warm butter over sugar and cream cheese and whisk to combine (some small lumps of cream cheese will remain but will smooth out later). Whisk in oil until incorporated. Add egg, milk, and vanilla; continue to whisk until smooth. Add flour mixture and mix with rubber spatula until soft homogeneous dough forms. Divide dough into 24 equal pieces, about 2 tablespoons each (or use #40 portion scoop). Using hands, roll dough into balls. Working in batches, roll balls in reserved sugar to coat and evenly space on prepared baking sheet, 12 dough balls per sheet. Using bottom of drinking glass, flatten dough balls until 2 inches in diameter. Sprinkle tops evenly with 4 teaspoons of sugar remaining in shallow dish (2 teaspoons per tray), discarding any remaining sugar. Bake, 1 tray at a time, until edges are set and just beginning to brown (don’t overbake! – EB), 11 to 13 minutes, rotating tray after 7 minutes. Cool cookies on baking sheets 5 minutes. Using wide metal spatula, transfer cookies to wire rack and cool to room temperature.